Do not be taken aback, as all the animals are tame and docile when they play with humans. Entrance to the cafe is free, but all visitors are expected to purchase a main and drink each in order to maintain the welfare of the animals. Expect to see domestic pets such as this Pekingese who stole the hearts of many visitors that day. The obedient dog is a joy to play with and loves to laze around while enjoying a scratch from many willing human friends. Other dog breeds they have include the cheeky Chihuahuas who never seem to get tired of dashing around the cafe, giving the entire space a lively atmosphere. The raccoon has its own special room and visitors are required to wait in line for their turn before they are allowed in. 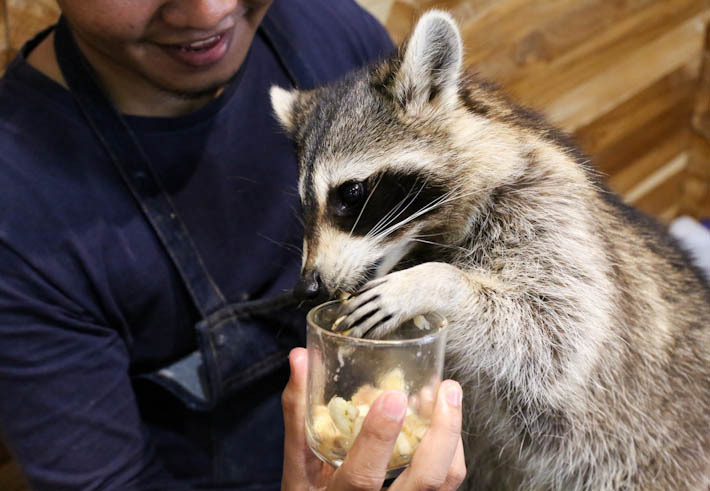 Once you are inside, you are allowed to interact with the raccoon and feed it. Just remember, no carrying is allowed! You no longer have to travel all the way to the Sahara of North Africa to see a Fennec fox! Little Zoo Cafe has two such foxes and these feisty creatures are mind-blowingly beautiful when you see them up close in real life. Those who prefer smaller animals will find plenty there as well. We particularly liked the Chinchillas and Parakeets as they are extremely adorable! 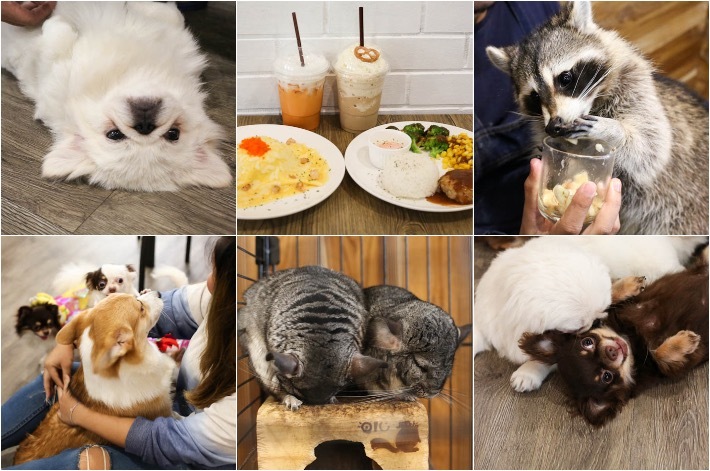 Unlike many pet cafes, Little Zoo Cafe has a full menu with appetisers, mains, desserts and beverages. We decided to go for the Omelette Lava Rice (THB215/S$8.84), Hamburg Steak With Rice (THB265/S$10.90), Thai Iced Tea (THB155/S$6.37) and Latte Frappe (THB165/S$6.79). While the food is not spectacular, the standard is decent as compared to many other themed cafes in Bangkok. Rest assured that the animals there are under strict supervision by the staff who do crowd control so that the animals would not feel overwhelmed and stressed out. If you are heading to Bangkok, read our guide to 28 best cafes in Bangkok.